I’ve been thinking about the importance of midtones lately; how when I analyze what I love about a painting, it is often the beautiful can’t-be-named midtones. Midtones are a favorite topic of mine. 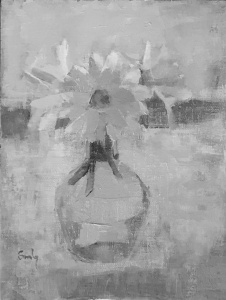 gerber daisies in blue bottle, 6×8″, oil painting on panel. This painting is currently at auction. Click here to bid. As painters, we know the importance of values, and I won’t pretend to have it all figured out. My own approach is to simplify, to limit, to push the values into groups. But it’s all relative, and the midtones in each painting will be different from one another. Like pretty much everything in painting, it’s not as simple as I sometimes wish it were. Gwen John, one of my favorite painters, is a master at using midtones. Her paintings are beautifully rich in their subtlety. It is subtlety that I am usually after. More often than not, I see things are more similar than different. Midtones are one part of capturing these close relationships. 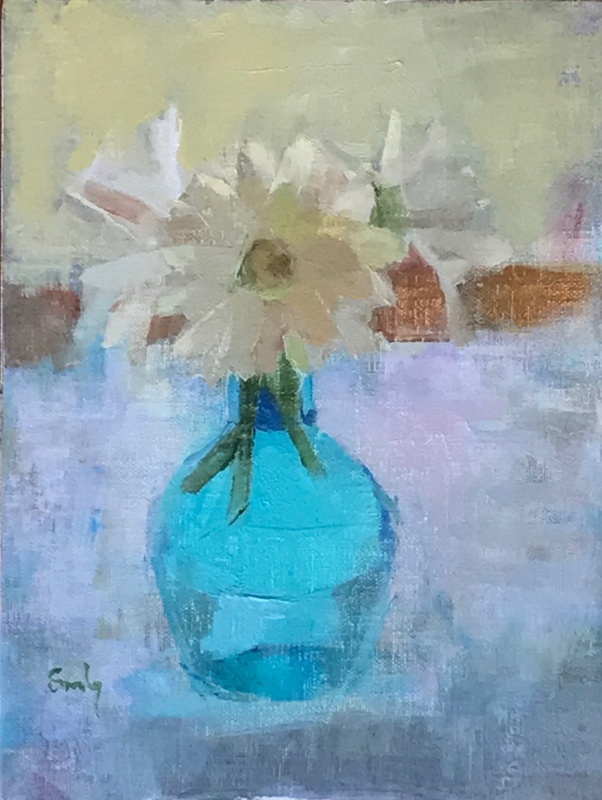 In this painting, for example, I was attracted by the color of the vintage blue bottle set against the white flowers that were in shadow. Initially, the bottle looked so light compared to everything else, but ultimately I settled on a version that brought the values closer together. I think I was being misled because the color was so strong. When I look at the black and white version of the painting, it’s interesting to me to see that it’s mostly midtones. There needs to be enough contrast to set one thing apart from another, and strong contrast can be incredibly beautiful and compelling. Midtones play a part there to connect the parts of the painting in a way that isn’t too jarring (unless, of course, that’s your intent). They play an important part in holding a painting together. I will continue to work this out as I paint. Best wishes, and thank you for reading. So excellent that you are giving your artwork the time it deserves. Love the blog. Hi Janine – Thanks for taking a look and for your support. I appreciate it very much. I hope you’re doing well and are painting a lot – I look forward to seeing what you’ve been up to.